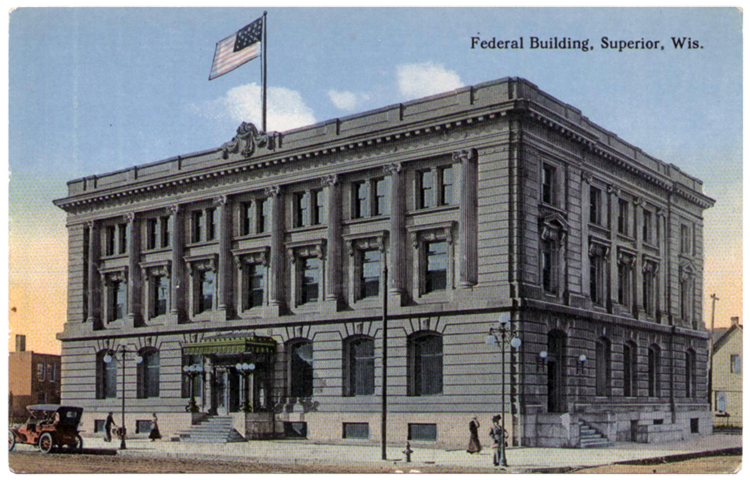 The Federal Building has been serving Superior since 1908, when it was built, as most federal buildings were at the time, as a courthouse, customs office, Internal Revenue office, home of U.S. Marshalls, and a post office. Successful lobbying nearly doubled the building’s construction budget, and the extra money was spent on extravagances such as marble, mahogany, solid bronze, and opulent furniture. In 1925 four men the local papers described as “gentleman burglars” broke into the Federal Building, while a fifth trained a gun on the family of Assistant Postmaster C. J. McGill, holding them hostage in their own home. Encountering the night janitor, the burglars bound and gagged him and placed him in the vault, promising him a $10,000 reward for his silence once they were able to convert their booty into cash. They walked out of the Federal Building carrying $71,000 worth of postage stamps.